Can You Cook Freezer-Burned Meat? Freezer burn appears on meat when frozen molecules from water move away from your food and stick to the coldest sections of your freezer. This dehydrates the meat and discolors it. The meat may have a grayish color in certain sections. Although freezer-burned meat may not appear appetizing, you can safely cook it without the risk of food-borne illnesses. 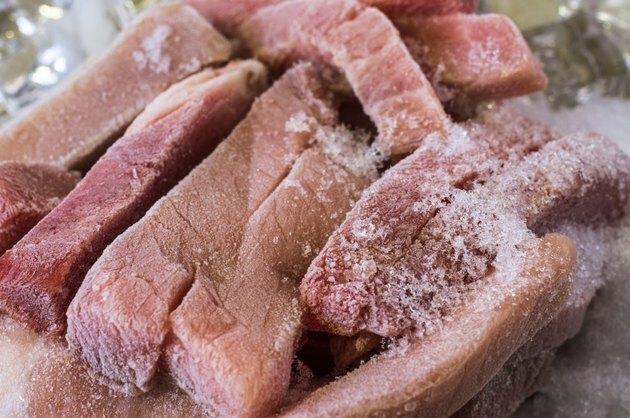 Freezer burn on your meat may have been caused by storing the meat in the freezer for a prolonged period of time. Uncooked meat is likely to stay fresh and avoid freezer burn if used before four to 12 months. If you change the temperature of your freezer, you may have also caused the meat to sustain freezer burn. The temperature of your freezer should be set at 0 degrees Fahrenheit to avoid freezer burn. If food isn't stored in an air-tight package, it is also at risk for freezer burn. Freezer burn does not make meat unsafe to eat, merely dry in certain areas, according to the United States Department of Agriculture. Since the quality of the meat may be compromised, you are not likely to want to cook the portions of the beef that has suffered freezer burn. Instead, cut away the pieces that have been affected and cook the rest of the meat. If you decide to cook the freezer-burned meat, you can thaw it in the refrigerator first or cook it directly from a frozen state. Small cuts of meat may only need to sit overnight in the fridge to defrost while larger cuts may need two to three days. If you do cook freezer-burned meat directly from the freezer, it will take approximately take one and a half times longer to cook. If the meat has been heavily freezer burned, consider discarding it instead of cooking and serving the dish. Freezer burn adversely affects the taste and texture of the meat. When you cook and eat the freezer-burned meat, you may notice the texture is chewy and the flavors have dulled due to the lack of water. The Library of Congress: What Is Freezer Burn?